Winmate went out on a limb when the company introduced its E430 industrial PDA back in 2011. It was an Android device and had a capacitive touch screen at a time where Windows Mobile and resistive touch still dominated. The E430 was successful, though, and is still available today, now in its 3rd generation. And now the E430 platform is joined by the larger E500, again with Android and capacitive touch. What was Winmate's motivation to create the E500 platform? Most likely to fill the gap between the 4.3-inch E430 handheld and the 7-inch M700 small tablet platforms. Over the past few years, smartphone displays have crept up into the 5-5.5 inch range, which makes the E430 appear smaller than it was perceived at its introduction. A 5-inch display is noticeably larger and thus looks more modern. And it has considerably more room to work on. But why not go to 5.5 inches like the iPhone 6 Plus? Likely because the extra size and weight that comes with a rugged design and its extra features would then make it a bit too large and heavy for a handheld. So Winmate settled on the 5-inch format, and made sure to make this new unit a veritable Swiss Army knife of a mobile computer, one where customers can decide which blades and tools they want. As far as the basic hardware goes, Winmate went with a 1.3GHz octa-core ARM Cortex A53 processor, 1GB of SDRAM and 8GB of eMMC that can be complemented via micro-SD Card memory. The rechargeable 14.4 watt-hour Li-Ion battery, good for up to 20 hours, is user-accessible and replaceable, something we also like to see in a professional computing device. The 5-inch display has 1280 x 720 pixel resolution. That's 294 ppi (pixel per inch), almost Retina territory and plenty crisp and sharp. The display is bright too - 400 nits - and sunlight-readable. There's, of course, capacitive multi-touch, but the device also has physical Android buttons (back, home, multi-task, function), always a good thing in an industrial PDA. The E500MR8 runs Android "Lollypop" 5.1. Lollypop is currently the most widely used version of Android, and will likely be for some time to come. Even a couple of years ago a unit like this might have used Windows Embedded Handheld, but that OS is now past just legacy, and its replacement - Windows 10 IoT Mobile Enterprise - isn't quite ready yet. 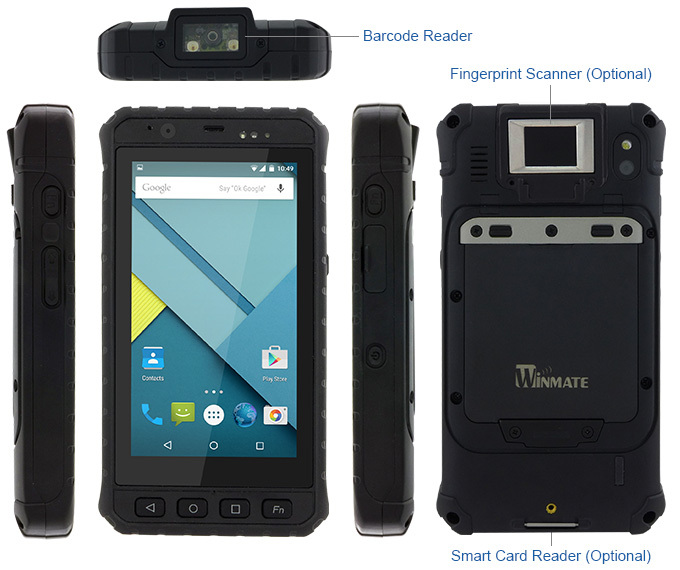 As we'd expect from Winmate, the E500RM8 is a remarkably rugged device (and looks it, too). It can handle 4-foot drops to concrete without additional protection, it can handle a wide operating temperature range of -4 to 122 degrees Fahrenheit, and sealing is at the IP65 level, which means the device is completely impervious to dust and can handle water jets from all directions. That's all very respectable, but why not IP67, higher drops, and an even wider temperature resistance? Likely because of the E500RM8's roster of data capture options which are a bit harder to seal and ruggedize. The standard version comes with NFC, but customers can also order versions equipped with a 1D/2D Barcode Reader, Smart Card Reader and Fingerprint Scanner. Connectivity consists of micro USB on the wired side, and dual-band 802.11a/b/g/n, Bluetooth 4.0, GPS and mobile broadband on the wireless side. Dual SIM slots add versatility. The device also comes with dual cameras, 2mp in the front for conferencing, and 8mp with LED light in the rear for documentation. The Winmate E500RM8 is clearly a tool for the job. It's angular and business-like and can ready to get to work, whatever and wherever that may be.